According to many Indigenous cultures, women are the keepers of the water. Water is our most precious resource. It is our responsibility, as women, to appreciate the water and to ensure the health of the water for the next seven generations in to the future. There is an Indigenous saying that states, “When the Grandmother’s Speak, the Earth will heal” and another that states, "We are the ones we've been waiting for"…. This is what brought the first group of women together in 2010 to plan the Grandmothers Gathering for Gitchigaaming (Lake Superior). We gather at Mooningwanekaaning-minis (Ojibwe language for Flicker Island or Madeline Island, WI in English). Located opposite Bayfield, WI, she is one of the 22 Apostle Islands in Lake Superior unique in her historic, spiritual and political importance to the people from this area. We gather to appreciate Lake Superior, the largest freshwater lake in the world by surface area, holding 10% of the world’s freshwater. We place our positive relationship with the water as the reason for coming together and the focus of our attention. The deepening of our relationship with water is inspired by Dr. Masaru Emoto’s water research and by our basis of understanding. Express appreciation to Lake Superior, the largest fresh water lake in the world by surface area, and all water. 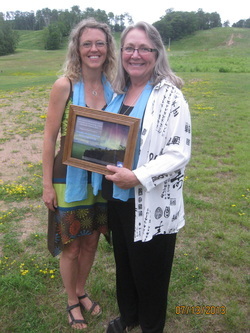 Gift and celebrate Lake Superior and all water as one, acknowledging the interconnectedness between all things. Create and communicate a vision of Lake Superior and all waters as healthy now and for future generations. Hold and amplify this vision into the future. This is a vibrational universe and water is vibrational. Thoughts and expressions send out a vibration. When coupled with emotions the vibration amplifies. What we imagine and give attention to, either positive or negative, with our mind and expressions, becomes our world. Positive thoughts and expressions through words, songs, offerings etc. have the power to positively affect water. Water is alive and has a spirit that responds to humans. We are 70% water and our health is influenced by the health of water. All beings are connected as one through the water. Water is the great unifier. Respectfully approaching water as a living being invites expression of appreciation before using it as a resource. Elder women have an accumulative knowledge and intensified focus that can be beneficial to the water and the next generation of beings. Gathering diverse elder women together with the intention to appreciate Lake Superior amplifies the positive health of Lake Superior and all water for the future. All diverse positive thoughts and expressions by women and others towards Lake Superior’s future health are valuable and encouraged without judgment. Communication between generations and genders is valuable and important in holding the vision of a healthy Lake Superior into the future. Sharing the gifts we receive from our focused time together with our communities creates greater awareness and amplifies the positive impact on water. Action is a logical outcome from our shared focus that will be individually and collectively guided by spirit and volunteered at will. Thank you to the Grandmothers that are gathering around the country! Please enjoy their sharing in the Grandmothers Circle of News. The Lake Superior Binational Forum’s panel of judges, choses award recipients that have accomplished significant and successful actions that minimize negative impacts or restore the natural environment in the Lake Superior basin. The awards program pays tribute to recipients that have demonstrated a commitment to environmental stewardship through outstanding leadership in one of five categories: Youth, Individual Adult, Business, Municipality, Business, Industry or Organization. This is what they shared about GGG: According to many Indigenous cultures, women are the keepers of the water, and water is our most precious resource. It is women’s responsibility to appreciate the water and ensure its health for the next seven generations. The volunteer women who organized “Grandmothers Gathering for Gitchigaaming “Lake Superior” brought 45 Grandmothers and others from across the U.S. to participate in four-day gatherings on Madeline Island that celebrated this sacred role, the sacred island, and Lake Superior. The volunteers helped diverse elder women and women from different cultures and backgrounds come to the gatherings and participate in water blessings, prayers, and songs. The participants shared their wisdom, vision, and gratitude for the water. It is the Grandmothers’ strong belief that the water responded to their loving attention. These important annual gatherings held in mid-August have come to be highly regarded by guests around the region as a special place to create a healthy future for all waters and celebrate the interconnectedness of all things and people.